The past year has been a busy year for everyone here at Echelon. As we look back on 2017, we are reminded that the services we provide play a crucial role in creating a sense of safety and security for our clients. We are also aware that security and safety has become a top priority for many organizations over the last year. Since we’ve put so much thought and effort into developing our exceptional team of security professionals, that we thought we would provide our list of the most important qualities needed to be a top security officer. 1. Well Trained Topping our list is the certainty that a great security officer should be well vetted and trained. Good training can help keep a bad situation from growing out of control, and can potentially keep people safer and even save lives. And since there are so many different situations in the public and private sector that may require security officers, from personal protection and armed guards to school security, loss prevention and crowd control, it is essential that the officer with the right training be placed at each jobsite. 2. Communication Skills In many security scenarios, the ability to quickly assess a situation and communicate it accurately to the rest of the team and to those whom you are hired to protect is essential for any good security professional. Understanding the immediate needs and choosing the right words to communicate can be crucial whether you are communicating verbally or using technology to report or document an incident. 3. Honesty Security officers are charged with protecting not only people, but property, inventory, cash, valuables, equipment, facilities as well as many other types of assets. Honesty and integrity are key ingredients for success. Since security officers often have unrestricted access to all of the above, there will be ample opportunities for theft or deceit, but a good, honest guard with a well vetted background check will be much less likely to succumb to such temptations. Integrity and honesty are absolute musts in our book. 4. Mindfulness In the majority of situations where a security officer is employed, there will be a potential for interaction with all types of people. Imagine a large office building in a major city. In any given day, a security guard might encounter people of all different ethnic and economic backgrounds. International business people, tourists and even homeless people looking for shelter or a place to rest. Security guards should be trained to act as a goodwill builder, concierge and brand representative. When challenges arise it’s also important that guards have been taught to manage aggressive behavior. A good security officer knows how to assess people’s demeanors and de-escalate situations mindfully so they do not erupt into conflict. 5. Vigilance Security professionals are generally required to either be on patrol or posted at one location (seated or standing) for hours at a time. It’s essential to stay alert and vigilant as not to allow attention to be diverted by distractions or boredom. An unmindful officer can easily miss a thief in action or fail to notice suspicious, illegal or unwanted activity. 6. Physical Fitness If a security guard is not in decent physical shape, it is unlikely that he or she can perform their duties adequately. Not only do guards often need to be on their feet for long periods of time, but they may need to run, carry heavy objects and perhaps even break up fights or apprehend intruders. Also, a superior physical appearance helps to project authority, professionalism and commands a sense of respect. With 18 years of experience in the security industry, we strongly believe that these are some of the most basic qualities that a good security officer should have. Since our company is constantly recruiting security guards to keep up with demand, we are always on the lookout for these qualities. 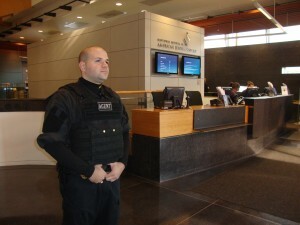 We want all our clients to be confident that we will provide them with gold standard of security guard services.